Racing fans could be forgiven for thinking Christmas has come twice in little over a month after a host of the sport's biggest and best names were declared to be in action this weekend. Cheltenham stages a monster nine-race card on Saturday that features the latest appearance of the mighty King George VI Chase winner Thistlcrack in the BetBright Trial Cotswold Chase. The Timico Cheltenham Gold Cup favourite will face six rivals including a revitalised Many Clouds, a leading contender for the Randox Health Grand National. A winner of 16 of his 21 starts, Un De Sceaux is also set to star on Cheltenham's bill in the Spectra Cyber Security Solutions Clarence House Chase, which has been switch from the frost-hit Ascot last week. Charli Parcs and Defi Du Seuil, principals for the JCB Triumph Hurdle at the Cheltenham Festival in March, have been declared to clash in the Grade 2 trial on Saturday, which is registered as the Finesse. JP McManus owns the pair and his racing manager Frank Berry said on Friday morning: "At the moment Charli Parcs is a definite runner. Defi would only run if the ground becomes very heavy, in which case it's possible Charli Parcs wouldn't run. Nothing is set in stone, though." Another McManus ace – Sun Bets Stayer's Hurdle favourite Unowhatimeanharry – also runs at the track and he bids to make it eight wins on the spin in the galliardhomes.com Cleeve Hurdle. Six of Cheltenham's nine races will be live on ITV4, which will also screen action from Doncaster. 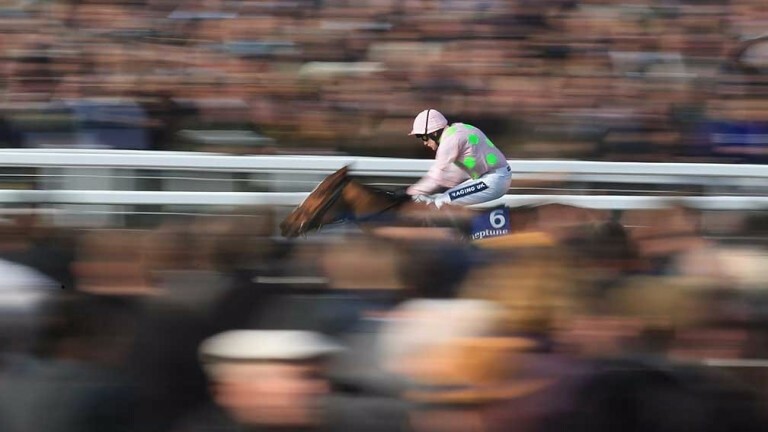 Vroum Vroum Mag, who has a stack of blue-chip entries at the festival, runs in the olbg.com Doncatser Mares' Hurdle, while her Willie Mullins-trained stablemate Faugheen, beaten only once in 13 starts, returns after a year off in the BHP Insurance Irish Champion Hurdle at Leopardstown on Sunday. Favourite for Cheltenham's Stan James Champion Hurdle, he faces four rivals in the Grade 1 he landed on his last appearance. The other Grade 1 on Leopardstown's card – the Frank Ward Solicitors Arkle Novice Chase – will not feature Mullins inmate Min, but Bleu Et Rouge and Royal Caviar represent the champion trainer against the classy Identity Thief.